It can be tough to get students engaged with poetry, but I have found a solution! Poetry Bellringers. I created this resource as a way to share several classic poems with students in a short amount of time. There’s no over-analysis here – each activity is short and targeted. 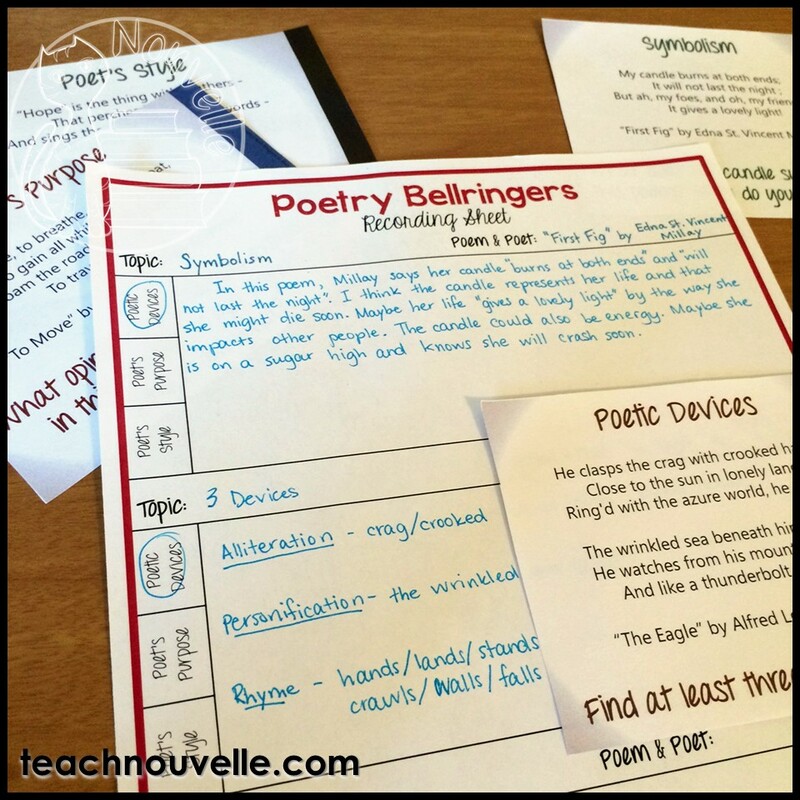 Also, since each activity is a Bellringer, or happens within the first few minutes of class, they can be used in conjunction with other poetry activities. Each of these thirty bellringers has a snippet of a classic poem, or the whole thing if the poem is short. Then, each bellringer has a different creative or analytical prompt. Students could identify poetic devices in one poem, illustrate another, create a new poem in the same style, etc. Exposure – If you use one a day for a four-week Poetry Unit, your students would be exposed to twenty poems! Energy – After the Bellringer phase of class, you could extend your study and conversation about a certain poem, or you could move on. If you decide to move on (which I do), students won’t feel like they’ve beaten a poem to death. Intrigue – If you’re only presenting a snippet, students are free to explore the rest of the poem or poetry by the same poet on their own. This promotes autonomy in learning. Enthusiasm – My students LOVE to share their creative responses. I once had a student write an amazing “Death is before me” copycat poem about having had to run the mile in gym class that day. Since there are thirty total possibilities, it’s easy to differentiate for your different levels. Last year, I assigned some more abstract concepts to my Honors group and stuck with Identification and Create-Your-Own with my struggling readers. I only did twelve in my unit last year, and gave students the rest to work on for review/extension. You can have students record these in their notebooks, leaving room for three Poetry Bellringers per page. You can also print out this FREE RECORDING SHEET. Either way, students will be able to track what poems they’ve pondered and enjoyed, and thus be able to find their favorites later if you assign an Anthology Project. You can try a free week of these Poetry Bellringers here. I know your students will enjoy them and find some new poems to love. Thanks so much for reading! Happy teaching! I truly do need to add in more poetry to my students’ day. This is a perfect way to incorporate creative writing and poetry interpreting skills. Thank you! These bell ringers look amazing. I love the snippet idea: keep ’em coming back for more! Thanks for sharing your ideas, Danielle. I love bell-ringers, too! Poetry ones are perfect for “not beating a poem to death.” 🙂 Thanks for the ideas! I’m always looking for new ways to teach poetry and poetic devices. I love that these can be used for shorter activities, and that then I can turn them into longer lessons for skills that need extra practice. Thanks! The use of poetry snips is a great idea! Short enough that anyone can suffer through it. I’ve also found some students do really great poetry imitations! These bell ringers look like a great way to begin class during poetry units. I like how you only provide students with a snippet of the poem! Thank you for the lovely offer, I am headed there now. I know with my RSP kids, the briefer text of most poems lowers their anxiety. 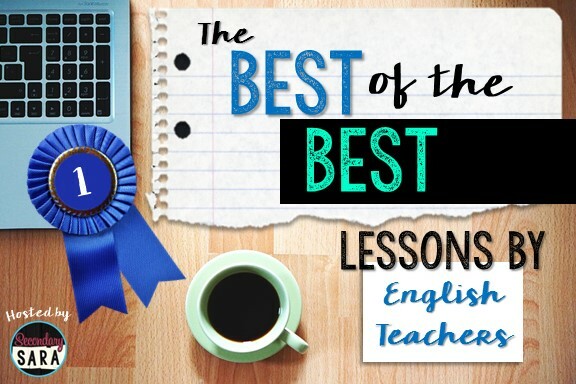 Students often handle poetry much better in small bites, so these bell ringers include just the right amount of text. It’s very likely that once students have digested a snippet, they’ll want to read the rest of the poem on their own. Perfect! Love this idea! My students have generally dislike poetry in the past. I really appreciate the idea of giving them small snippets at a time just to expose them and have them practice with important literary devices. I’ll be checking out your store. Thanks for sharing! Oh man, I LOVE this blog post and the idea of poetry bellringers. Poetry is not my strongest subject and I always struggle with how to introduce this style of literature to students. I think that the idea of exposing students to smaller sections of a poem each day is a fantastic way to help students become familiar with poetry and more comfortable with tackling these complex texts. Thank you for sharing your expertise! What a fun and engaging idea! I love teaching poetry and I’m always looking for new ideas – thanks! I love this! We just started our poetry unit, and this is PERFECT! I’ll definitely be checking this out!